New apartments at the bio farm with modern alpine style, dreamlike view & countless activities in the environs. Welcome to the Apartments of Enzianhof in St. Johann in Ahrntal! 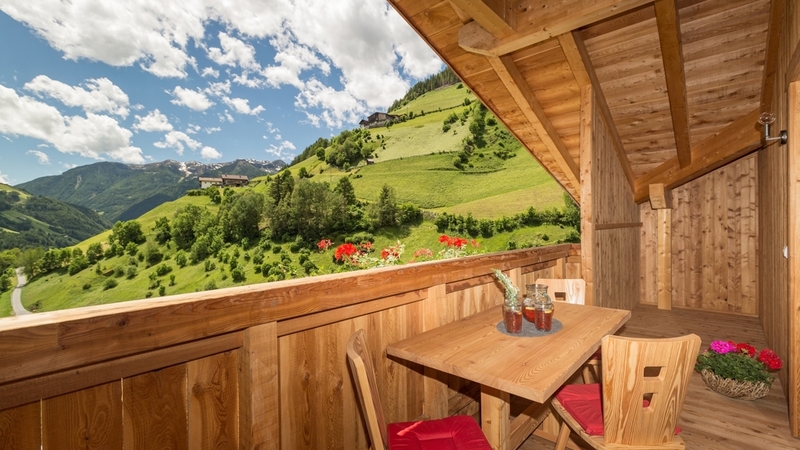 Our Enzianhof in Ahrntal is situated on the sunny side of Zillertal Alps on 1150 m and is a good starting point for countless holiday activities. The new bio farm is characterised by modern furnishings and by a dreamlike panoramic view over the mountain world. The large window fronts and balconies connect the inviting rooms with the unique cultural and natural landscape of Ahrntal. Our new apartments are spacious, light-flooded and offer an alpine design. They are perfect for 2-6 persons, dispose of at least one balcony or a terrace and are equipped with natural wood of local larches and pines. Children’s beds are available if needed. WLAN is free in the entire building. The spacious outdoor area of our bio farm with sun terrace, natural ponds and climatic gardens is ideal to relax and to discover the natural landscape in the environs. Discover our historical mill, get to know our farm animals and regenerate by walking in our Kneipp basin. Right next to the 300-year mill, there is the children's playground with sandbox and trampoline, petting zoo, two bathing ponds with a float and a sunbathing lawn. At Enzianhof, we also offer car parking, ski deposits and ski shoe warmers. Our Enzianhof in Ahrntal is a good starting point for exciting holiday activities all year round. With Holidaypass Premium, you can use all means of public transport in South Tyrol for free, have free entry or reduced prices in many museums and can participate at a varied activity programme. In summer, 80 peaks which are higher than 3000 m, magnificent hikes and unforgettable bike tours await you. In winter, the magical snowy landscape of Ahrntal is a paradise for skiers, cross-country skiers, snowshoe hikers and all other winter sports fans. Home made products, Gratis Skibus, Sunshade, Deckchair, Ski depot in the house, Multilingual receptionists by day, laundry service, Snow boot dryer, Environment award, Bike deposit, Family-friendly, Barbecue facilities, Secured storage spaces for bikes and motorbikes, Express check in/check out, Baggage storage, Quiet position, above 1000 m a.s.l.